If the LG Watch Urbane wasn't enough for you to think about, then you'll be glad to know that LG also announced a second smartwatch, but rather than being powered by the Android Wear platform, it's actually based on webOS. Who knows why the decision was made to name this smartwatch as the LG Watch Urbane LTE, especially when its sibling is running Android Wear. 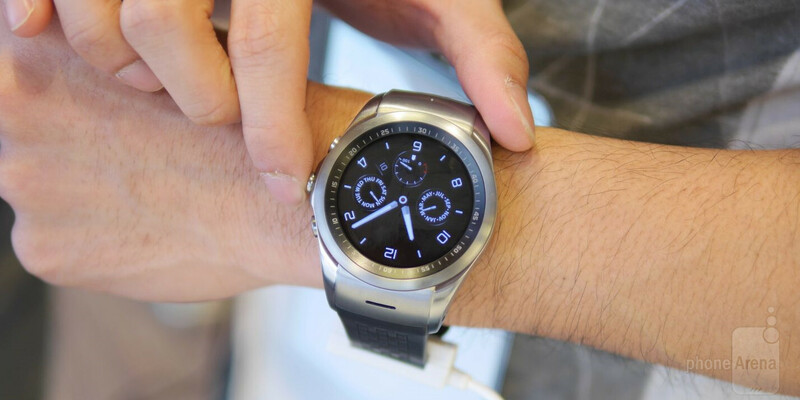 There might be a little confusion, but as its name implies, it features LTE connectivity – making it an independently working smartwatch. Visually, this one is totally designed differently, as it exudes a more ruggedized construction, which becomes apparent when wearing it. For starters, the metal casing itself is undeniably sturdy – further accentuated by the substantial rubbery strap that's fastened more securely onto our wrist. Along the right size of the LG Watch Urbane LTE, there are three buttons that turn on/off the watch face, launches the connectivity options, and a final one that acts as the back button. Rather than having the sophisticated look similar to its sibling, the LG Watch Urbane LTE feels like something that an outdoor enthusiasts would wear – so if you're into hiking, running, and being in the great outdoors, this is surely being marketed to you. Unfortunately, though, it uses a fixed strap, so there's no replacing it. As for the software powering it, like we said, it's "based" on webOS. Being an independently working smartwatch, one that doesn't necessarily require a smartphone to function, it means that users can send text messages, emails, and even make phone calls through the smartwatch. From the looks of it, the LG Watch Urbane LTE is preloaded with an abundant set of health and fitness apps, but the biggest concern at the moment is going to be how quickly and frequently we'll see other apps developed for it. Interacting with the interface is done through the 1.3-inch 320 x 320 POLED display, which is exactly the same one in the Android Wear powered one – while the buttons on its side are used to navigate as well. As for the internal components, it features a 1.2GHz Qualcomm Snapdragon 400 chip, 1GB of RAM, 4GB of internal storage, 700 mAh battery, LTE, Wi-Fi, Bluetooth 4.0, NFC, GPS, accelerometer, barometer, and a heart rate sensor. LG claims that it'll deliver roughly a day's worth of battery, but it'll be interesting to see how it really performs – more so when there’s an LTE connection with this. Based on what it features, it’s really tough to imagine the LG Watch Urbane LTE sporting an easy price point, especially considering that it boasts several phone functions. We can still dream about something marginally affordable, right? Well, LG is keeping a tight lip regarding its pricing and availability at the moment, but hopefully we’ll hear more in the coming months. A serious game changer, Google really needs to step up their game. Just so you know there is two different LG Urbane smart watches. The Urbane LTE version is using LG's WebOS, where as the non LTE version is using Android Wear. They basically look the same, except the LTE version is about 2 mm fatter, with 3 buttons instead of 1, LTE version has NFC, WiFi n, a speaker, 1 GB of ram, and the bands are not interchangeable. The only thing I wish Android Wear had support for would be WiFi, and maybe a speaker. Although Android Wear devices can pair to any bluetooth headset or speakers. I understand the differences between the Urbane and the Urbane LTE, I think Google should include support for features with the LG Urbane LTE has such as calls, more buttons, built in speakers, cellular data etc. Android Wear has barely advanced since it's announcement. They don't look the same. Actually the Urbane LTE is really stunning. Shame only for the non exchangeable strap, but it seems they put a bit of effort to it anyway. Of course unlike the android Urbane, the LTE is really only for men. Best looking smartwatch, are you kidding me? Can easily be the most functional though. Which one is the best looking smartwatch for you? If they put the webos/wearables software on the regular Urbane, i will buy it in a heartbeat.